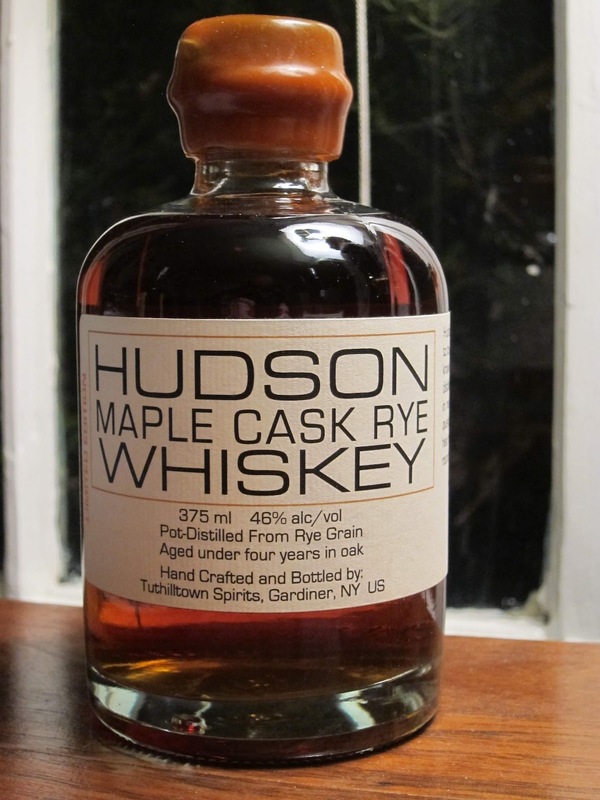 Hudson Maple Cask Rye Whiskey (46.0%): The day after Christmas we stopped by at Gable Erenzo's new project Gardiner Liquid Mercantile in Gardiner for a couple of drinks and some quick bites. Gable, as many of you know is one of the names behind the success of Tuthilltown Spirits with his father Ralph Erenzo and his place in town is serving amazing food and booze sourced only from local farms, breweries, wineries and distilleries... On our way out I had the chance to grab a bottle of the latest batch of Tuthilltown Spirits Maple Cask Rye Whiskey which I will be tasting today. Tuthilltown sends some used whiskey barrels to Woods Syrup, a maple syrup producer in Vermont who ages their syrup in those barrels. After they are done the barrels are sent back to Tuthilltown and used again this time to finish off their rye whiskey. I remember liking it very much when I tasted the first batch a couple years ago at a tasting event but since then they started to release them annually and I didn't have a chance to taste again. This bottle I have is the first batch of 2015 and is numbered as 9927. Color: Dark amber, chestnut honey. 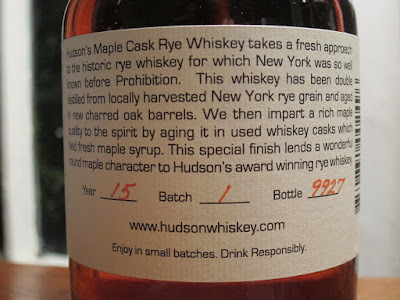 Nose: If you ever walked in an American Craft Distillery that is the smell you will get right away: A pungent toasted oak smell you cannot identify where it is coming from. Is it coming from the tiny barrels on the racks, do they have a fireplace somewhere left fuming from last night or is it simply the walls and ceiling of the wooden rustic barn the distillery is in? You can never tell but that smell fills your nostrils... That's the first and only thing you get when you bring your nose close to the glass. After letting it air for a good amount of time similar but more layered aromas evolve: vintage furniture, tung oil, chimney soot and toasted cloves. Linseed oil, cinnamon sticks and hot toddy. Very young and quite hot. Adding a few drops of water helps immensely. Still woody but way gentler: Heavily roasted coffee beans, vanilla and maple syrup aromas slowly join. Garam masala, allspice and nutmeg. Old leather jacket, cowboy boots, aged grappa and cooked zante currants. Palate: Young toasted oak and bitter tannins. Very dry... I can totally taste some of the sweet notes of maple syrup when I look for it but they are all covered by strong oaky notes. Cinnamon Altoids, cloves and vanilla. Adding water brings much needed help. Now it tastes like a very young armagnac: Buckwheat honey, coffee cake and Werther's Original caramel coffee hard candies. Dark chocolate covered orange peels and quince jam. Finish: Long and sizzling with tannins, orange zest and cracked black pepper corns. Overall: Well, this was a tougher ride than I ever thought it was going to be... Adding water helped a lot luckily, both on the nose and on the palate... I admit my expectations were way higher to begin with but on the other hand I was pretty much prepared for a typical American craft distillery product. Ok, let me make myself clearer. Here is my take on this issue: I don't see any change coming in near future. It is what it is... The distilleries will continue to use these tiny barrels and all kind of other rushed maturation techniques. We definitely don't have to get used to it, approve these gimmicks and/or consume their products of course but personally I don't want to ignore hundreds of distilleries all round the country for good either and I don't want to miss a surprisingly good product which might hit the shelves out of nowhere. I want to keep tasting... Maybe it's time to classify these whiskies as a separate category, I don't know. It might help me at least to handle the situation. But there is absolutely no scenario to justify these crazy price tags attached to those bottles. Still cannot wrap my head around that... At the end this is an incredibly expensive whiskey and none of its qualities is good enough to make its price acceptable for me.